When your business depends on getting customers, members or users to register, offering a useful service is a great incentive. This can induce a prospect to sign up, log in, and return to your site. Our planning module gives a registered member powerful interactive tools to use for planning a major event. Created for a wedding planning site, this system can be adapted for other settings in which users plan major events. Examples could include vacations, conventions and trade shows. All the user's data is private and secure, accessible only with a username-and-password login. Helping the user to link to resources can reinforce the website owner's competitive advantage. In this example, prospective brides and grooms can select potential wedding vendors from the site's database of advertisers. Creating this "my vendors" list helps solidify relationships between site users and affiliated businesses. Access to detailed information about these local vendors is emphasized as a key reason to sign up and use this free system. Countdown checklist. 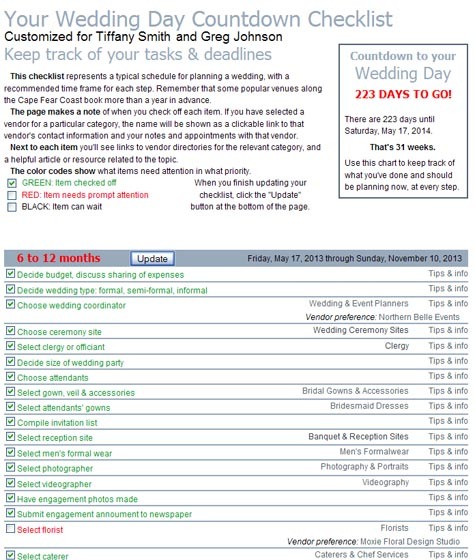 As the event date approaches, unfinished tasks gain greater urgency, shown by color coding: Red for those requiring prompt attention, green for those completed, black for tasks that can wait. One-click links let users browse potential vendors for each task, and create a "short list" of those under consideration. When a vendor is been selected, the system creates a link to that business's online listing for the user's convenience. Appointments calendar. Users can quickly create entries for planned meetings or consultations, with private notes about the vendor. A one-click feature hides or shows past calendar entries, as needed. 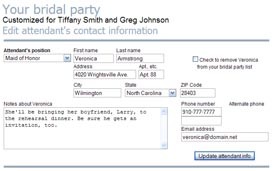 Personalized address book helps user keep track of key contacts, as in this example from an engaged couple's bridal party list. Bridal party address book. An easy way to keep names, mailing addresses, email and phone info for essential attendants in one place, and send messages to some or all through a simple online form. Free personal wedding pages. A user can create a web page with information for guests, including links to hotels, a list of bridal registries, and link to the wedding photographer's "proof" site for guests wishing to buy photos. This page is accessible only with a special password that the user can send to those she wishes to use it. Personalized wedding planning checklist uses couple's wedding date to calculate time remaining, highlight tasks remaining to be done. Click to see full size.